Getting along with a dark theme is all about character. If you find it useful, have fun with it!!! it probably looks great on xp but it really isn't ready for vista yet. the start menu needs to be adjusted in various ways before it's ready for vista. but, like i said, it's probably great on xp! Very nice WB, was wondering if you could tell me where I can get the WP you used would be great. Comment#3 Snidely Whiplash said "it probably looks great on xp but it really isn't ready for vista yet. the start menu needs to be adjusted in various ways before it's ready for vista. but, like i said, it's probably great on xp!" Why don"t you explain what in various ways needs to be adjusted in vista..I am using it in Vista now and I don,t see any.Good job REMOLACIO and like the color. well, beaddie, take a look at your start menu. when you click on the 'all programs' area, do you see the entire breadth of the list of apps? no, you don't. the left side of the start menu needs to be wider than the right side in order for it to be usable for vista. are the search panel and shut-down buttons centered? no, they are not. there, those are two things that need to be corrected. the easiest way to do so would be to have xp and vista subskins. as much as i like this blind (and i really do like it! ), it just isn't a vista blind. it's an xp blind that 'works' on vista but isn't usable on vista in my opinion. 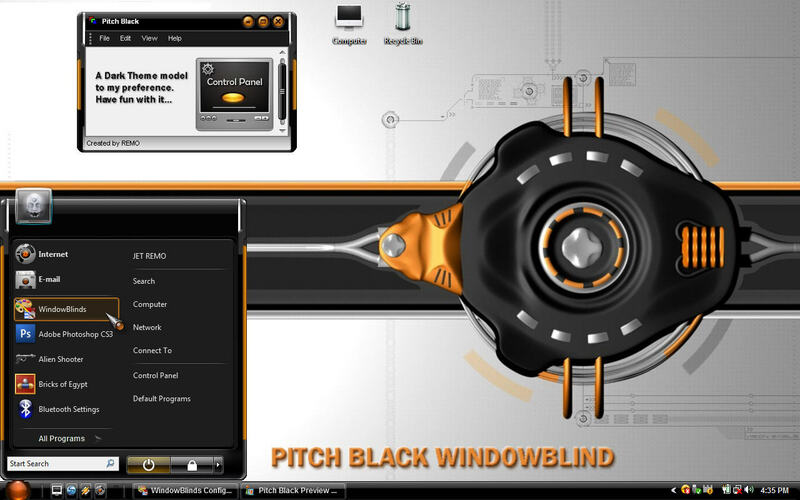 it's just like any other blind made before vista was released that 'works' on vista. i'm NOT being critical of the blind. it's a fantastic blind ......... on xp. Could you please put up a link for the wallpaper? A dark, usable skin! I like! I do agree with Snidely Whiplash about it being Vista ready, though. The start menu needs help, and there are many and varied little things that could be done to make it more suitable for Vista, but all in all, REALLY GOOD!